Marvel Studios’ “Thor: Ragnarok,” electrified both audiences and critics alike and now fans can enjoy the colorful cosmic adventure at home. 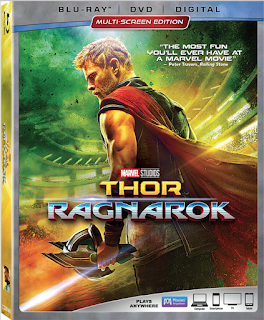 Fans who bring home the Ultimate Cinematic Universe Edition (4K Ultra HD + Blu-ray + Digital) of “Thor: Ragnarok” will experience all the thunderous action and lightning-fast wit in stunning 4K Ultra HD with next-generation high dynamic range (HDR) visuals and Dolby Atmos immersive audio. Exclusive, never-before-seen bonus features include deleted scenes; hilarious outtakes; an exclusive short: part three of the mockumentary “Team Thor,” retitled “Team Darryl” and featuring an eccentric new roommate; the evolution of MCU’s heroes culminating in “Avengers: Infinity War;” numerous making-of featurettes which explore the unique vision of director Taika Waititi; the story’s unstoppable women; the effortlessly charismatic Korg; the tyrannical leader of Sakaar, the Grandmaster; and the film’s comic-book origins; audio commentary by Waititi; and more. The action, humor, drama and spectacle, bursts into homes Digitally in HD and 4K Ultra HD™, and Movies Anywhere, on Feb. 20 and on 4K Ultra HD™, Blu-ray™, DVD and On-Demand on March. 6.